The AMD Ryzen 7 may have upended the CPU industry and wowed the socks of reviewers and fans alike, but not everyone can afford them. Not everyone needs eight processor cores either. Ordinary users and gamers only need quad-core processors, after all. That’s where the AMD Ryzen 3 1300X processor comes in. The AMD Ryzen 3 1300X (Price Check) is a quad-core processor that supports up to four simultaneous threads, and boasts a 2 MB L2 cache as well as an 8 MB L3 cache. Priced at just US$ 129, it also comes with a bundled AMD cooler. Let’s take a closer look at Ryzen 3 1300X processor and check out how well it performs! Updated @ 2017-10-09 : Replaced all of the original charts with newer, better charts. Added a video on the Ryzen 3 1300X running CINEBENCH. Numerous other small updates. The AMD Ryzen 3 processors lack SMT (Simultaneous Multi-Threading) capability, which allows each core to handle two simultaneous threads, as if they are two virtual processor cores. It is only available in the higher-end Ryzen 5 and Ryzen 7 processors. The AMD Ryzen 3 1300X (Price Check) processor comes bundled with a low-profile AMD Wraith Stealth cooler, which adds to its value proposition. Let’s unbox it! Let’s take a closer look at the AMD Ryzen 3 1300X (Price Check) processor, which looks exactly the same as the AMD Ryzen 7 1800X (Price Check) processor. It uses the same 1331-pin AM4 socket as its more powerful brothers. In fact, processors from all three Ryzen families can be used interchangeably on any AM4 motherboard. 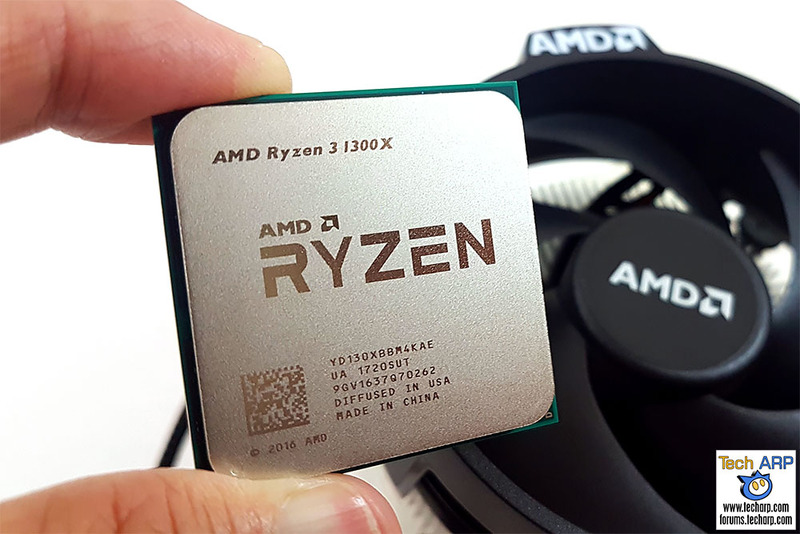 In this article, we will take a look at the work and gaming performance of the AMD Ryzen 3 1300X processor. We will it to the Ryzen 7 1800X (Price Check), the Ryzen 5 1500X (Price Check), and the Intel Core i7-6700K processor. Here is a table comparing their key specifications. Now, we would be the first to admit that this is a completely unfair comparison, but let’s see how this “underdog” performs against such a formidable field!